On August 21, 2017, a Monday, starting roughly around 9:00am Pacific time off the coast of Oregon, the Moon began eclipsing the Sun. A total eclipse of the Sun was visible from within the path of the Moon's umbral shadow starting around 10:15am Pacific, crossing the USA from west to east through parts of Oregon, Idaho, Montana, Wyoming, Nebraska, Kansas, Missouri, Illinois, Kentucky, Tennessee, North Carolina, Georgia, and South Carolina. The eclipse passed through South Carolina roughly around 2:30pm Eastern time. The Moon completely cleared the Sun off the coast of South Carolina just after 4:00pm Eastern time. Even if you couldn't travel that day, the Moon's penumbral shadow produced a partial eclipse, visible from almost all of North America. For members (you can reset your password as needed, and educators can register for your FREE Alliance membership): Share your eclipse event! NASA fans around the WORLD are planning their trips now! Let them know about your event, even if it's preliminary. If you share with us, we'll also make sure that your event is included in the official NASA eclipse event page. Find local and national collaborators for your event(s) through the Alliance network (members only). Also, reach out to your local Night Sky Network members, Solar System Ambassadors, and STARNet Libraries to make the eclipse the biggest even in your community! Getting a Feel for the Eclipse - a free tactile eclipse resource for members; designed for the visually impaired and great for any hands-on eclipse activity. Make your own Eclipse poster. Our members only Universe of Learning telecon for May 4th, 2017 will be connecting the eclipse to astrophysics, and our special 2 month event planning telecon. Ready-to-use educator PD presentation for members only, complete with a comprehensive speaker script and educational activities to share. Solar viewing glasses resource - Looking for eclipse glasses for your audiences? Read our guide. Member-only webinar series for professional development for you and your staff on interpreting the eclipse for your audiences, courtesy of the Earth to Sky Partnership. Demonstration of the NASA Eyes Eclipse module (among other modules). How to make a custom eclipse map (or any map) for your area and audiences. Apply to become an official NASA Event and/or an official NASA Subject Matter Expert for your local audiences. Our members-only telecon with the STEREO Deputy Project Scientist, Dr. Terry Kucera. It includes great presentation materials for solar science. Our members-only telecon about the 2016 eclipse and Mercury transit. Our members-only telecon from the 2008 total eclipse in China. For those hosting an event, remember safety and security. Order plenty of safe viewing methods, like eclipse glasses, or have materials on hand for visitors to make their own, like this pinhole camera. Safe viewing methods for all of your visitors shouldn't break the bank; they can be very affordable, especially if you plan on selling eclipse glasses in your museum store to recoup your costs. See the safety website for a list of certified vendors. Also, you'll always need extras for the next eclipse or just general solar viewing programming. Be clear to all of your audiences, including through your local media, that LOOKING directly at the bright Sun, regardless of time, requires safety precautions, but ECLIPSES themselves are perfectly safe. You may have big crowds, so if you're concerned with safety, alert your local law enforcement to have a prescence at your event, and be mindful of facilites such as parking, water, and bathrooms for your extra visitors. Also consider traffic safety, especially if you think people will be driving around escaping cloud cover. NASA's Official June 21st Eclipse Safety Press Conference and Science Conference (1 hour each). NASA Eclipse 2017 Website - contains activities, an eclipse party tips and toolkits, eclipse maps, and more. https://www.nasa.gov/eclipselive/, a part of NASA TV, will be the free broadcast of eclipse views and related programming when available. NASA Eclipse 2017 Safety - for example: "To date three manufacturers have certified that their eclipse glasses and hand-held solar viewers meet the ISO 12312-2 international standard for such products: Rainbow Symphony, American Paper Optics, and Thousand Oaks Optical." Beware of uncertified glasses that might be dangerous to use, and carefully examine any glasses for damage and safety before using them. General NASA Eye Safety guide is penultimately important. It also has some nice images of past solar eclipses, free to use on your own websites to promote safety. English and Spanish safety sheets are available in easy, downloadable PDF format. Quick, colorful Eclipse Fact sheet in English and Spanish. NASA Space Place Eclipse explanations for younger kids. NASA Eyes Eclipse Module - Interactive, 3D simulation where you can see what the eclipse would look like from anywhere on the planet, and see exact timing of the different phases. Eclipses and Transits page for latest news and images. Note that transits, essentially "mini-eclipses," are one of the best methods used in discovering exoplanets, like the TRAPPIST-1 system. Downloadable eclipse 2017 KML file of the path of totality, credit: Kevin Addison, NASA GSFC. Make your own custom map to help your local audiences. It’s as easy as making a spreadsheet. Beautiful Posters NASA created for Earth Day, most recently featuring the Eclipse. Remember, every day is Earth Day at NASA. NASA Eclipse 2017 downloadables, like web banners and flyers, as well as the Gallery, with videos, images, animations, etc. NASA Eclipse Preview - NASA Edge 30 minute show on the 2017 eclipse. ​Great 2017 visualizations, downloadable from the Scientific Visualization Studio, and general eclipse videos. Including this spherical video for VR, digital planetariums, SOS, and other spherical displays. Also, there's the summary video and tracing the exact shadow of totality above. Search for high resolution NASA images of eclipses. See the NASA Media Usage Policy for questions about usage. Also, see the SDO Gallery for awe-inspiring, general Sun multimedia. Official NASA Eclipse Activities and Education Resources, including a downloadable activity guide with more than 15 formal and informal education activities from which to choose. NASA GLOBE Observer Citizen Science Eclipse activity. NASA Night Sky Network's Yard stick Eclipse activity. Sun and Eclipse Activities from Sun-Earth Day (in both English and Spanish) Once there, be sure to look at "Past Sun-Earth Days" in the top menus for more resources, especially at "2006: Eclipse, In A Different Light"
Please note that NASA does not endorse third party commercial products. These are simply a sampling of available resources, and we encourage you to search for more. Any opinions, findings and conclusions, or recommendations expressed in third party materials are those of the authors and do not necessarily reflect the views of NASA. PBS - WGBH in Boston's Resources including recorded PD and toolkit. NISE Networks Eclipse Webinar, recorded for viewing, as well as an upcoming one. Space Telescope Science Institute Presentation - 1.5 hour presentation archived and recorded on Youtube. Includes general information, educational activities and demos, and more. Solar Eclipse "Megamovie" Project. See the Night Sky Network's webinar about the project. American Astronomical Society's Downloadable resources. Astronomical Society of the Pacific has a comphrensive list of other resources, including sources for eclipse glasses and Eclipse Outreach to Latino Audiences - Spanish printable resources from the Astronomical Society of the Pacific. The Night Sky Network resources include a ready-made powerpoint presentation specifically to engage people in the 2017 eclipse. Also, their list of events is a searchable database of amateur astronomy club events. Find and invite your local astronomy club to send a solar viewer to your site, before, during, and after the eclipse. STAR_Net article: "Solar Eclipse 2017: Programming More Important Leading Up to the Eclipse Than the Day Of"
The Morehead Planetarium & Science Center has a playlist of eclipse videos about the eclipse in the Carolinas. The Farthest - Howard Hughes Medical Institute has a new documentary for the Voyager 40th anniversary on August 20th, 2017, if you're looking to capitalize on the excitement around STEAM from the eclipse. See the trailer, and Museum Alliance members can request a free screening of the film on a wide range of dates at your site. Rice University's Eclipse Animations for full dome planetariums and flat screens. The Adventure Science Center has a planetarium show celebrating the eclipse. Contact them to show it in your own planetarium. The Exploratorium has more resources, and will have live broadcasts if you're clouded out. For reference, here's the Exploratorium's archived livecast of the 2016 eclipse, to give you an idea of what to expect (totality starts around 37 minutes). Also, here's their entire eclipse playlist, including some Spanish language videos. The Fiske Planetarium created a public service announcement about what to expect and how to protect your eyes. National Science Teachers Association has published a guide to the eclipse, and has free extras to support science teachers. Fun video about the eclipse from the Casper Planetarium. It's easy to embed it or any of the above videos in your own website for your audiences. Need help? Just ask us. Many Alliance members will host eclipse viewing parties, like the Oregon Museum of Science and Industry, one of the first places to see totality! Find other general events on our page, and specifically find eclipse viewing events (or submit your own) on the NASA eclipse event page. The Vanishing Sun, eclipse folk-tales from the Lunar and Planetary Institute. The Science‐Technology Activities and Resources Library Education Network (STAR_Net) provides eclipse event resources targeting libraries, including free eclipse glasses, and FAQs. STAR_Net's Eclipse Guide for Libraries and other educators. When the Sun Goes Dark, a newly published, illustrated story book about the eclipse. Astronomers without Borders is collecting donated eclipse glasses for other countries/eclipses. Make a professional-grade solar projector with this DIY project. US Postal Service will have a special commemorative stamp, released on June 20th, 2017. EclipseMob Citizen Science Webinar Series, including free project kits for informal educators, while supplies last. 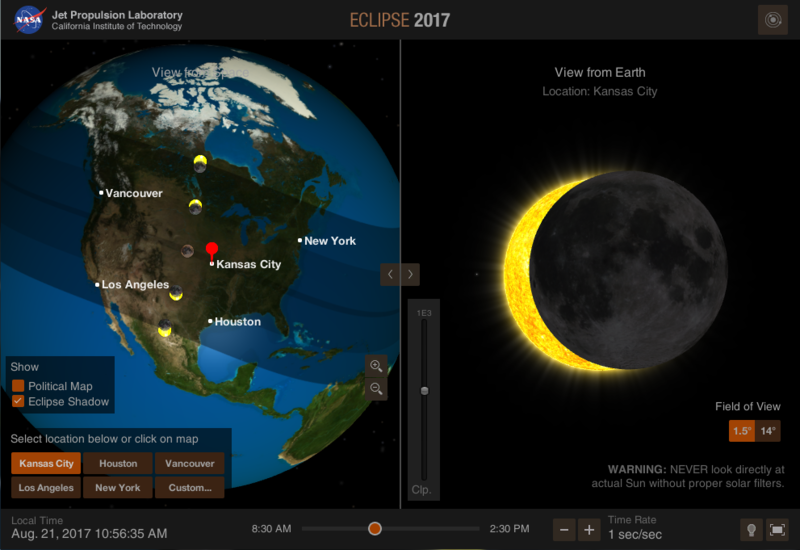 Eclipse Maps: See exactly where the path of totality is in any given section of the U.S.
2017 Eclipse Podcast - Short podcasts from the senior editor of Astronomy magazine on everything from eclipse photography to regional weather forecasts for the eclipse. There are several apps popping up to help with eclipse viewing, for example, TOTALITY. Free solar viewing glasses - get up to 4 with a self addressed, stamped envelope, and up to 100 free for a Title I public school. They also offer small quantities for 50 cents per unit, which you can compare to other sources. Suncalc.org and Mooncalc.org - exactly calculate positions of the Sun and the Moon.